It is also expected a further 20 private patients will take action in the New Year. MORE THAN 30 women are expected to launch legal action in 2018 because of complications suffered after vaginal mesh procedures, with ten of these cases to be taken against the HSE. The other 20 are private patients expected to take action against their consultants. Thousands of women across the UK, US and Australia are suing their public health services and manufacturers after experiencing issues such as chronic pain and infections following their operations. Transvaginal mesh devices are used in surgeries to treat two conditions women can develop following natural childbirth: stress urinary incontinence and pelvic organ prolapse. These procedures have been carried out on women in Ireland since the late 90s and are still performed today, despite the fact that one of the procedures has been effectively banned in Australia and the UK in recent weeks. Now we can reveal that at least 30 women will launch legal action in 2018 – ten of these will involve HSE patients and the other 20 were private patients. Solicitor Melanie Power, who said she has been contacted by upwards of 50 women about vaginal mesh surgeries, is representing 30 who will be lodging papers in the new year. Although she is pursuing medical negligence cases, Power is also looking at the possibility of suing the manufacturers of some of these devices. “More people are coming forward every day, it’s very sad,” she said. Documents released to TheJournal.ie under the Freedom of Information Act indicate two patients have already commenced action against the HSE. In correspondence between the Department of Health and the State Claims Agency in November this year, a department official was told that there is “evidence of incidents being reported as a result of side effectsto the procedure, but not many directly related to the device itself”. The State Claims Agency’s head of data services also said there were two “incidents” in 2017. Another email from Ciarán Breen, director of the agency, confirmed this as he stated that the agency has “two claims relating to TVIs (transvaginal implants)”. He added that both were “at an early stage”. Emails between the department and the Health Products Regulatory Authority (HPRA) reveal that, according to the authority’s figures, “over the last number of years, approximately 3,000 mesh devices have been supplied primarily by three companies to public and private hospitals in Ireland”. It pointed out that it does not hold a complete dataset of all devices and all manufacturers and that some of these devices may be more general surgical meshes – for use to treat a hernia, for example. The correspondence released to this website also reveals that department officials were briefed about mesh implants by the Irish Medicines Board (now the HPRA) back in October 2012. 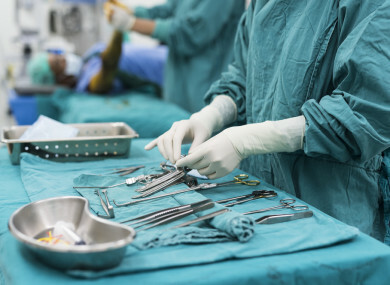 The briefing, which was given by the IMB because of extensive media coverage in other European countries, acknowledged that women in the EU who had issues “seem to have significant ongoing post-op complications that may require multiple surgeries”. “We only had a very small number of reports in Ireland,” department officials were told. It also said that at that time “no conclusive generic device family-related issue” had been identified. The IMB said it had written to the obstetrics, gynaecology, urology and general surgery community to seek feedback on the use of these products and to encourage reporting of adverse incidents. In one letter to the department, released through Freedom of Information Act, a woman wrote asking for information about vaginal mesh surgeries. She said she had her procedure four years ago and has “had many problems since, especially with recurring pain”. “It has recently been brought to my attention that the British and NI health bodies have been endeavouring to address the problem there and I would like to know if it has come to your attention recently,” she said. Two Irish women who suffered complications after mesh surgeries to address urinary stress incontinence shared their stories with TheJournal.ie this year. 65-year-old Margaret Byrne said she was never told about potential complications. After the recovery following her surgery had passed, she tried to resume sexual relations with her with husband and they soon realised something was not right. It took years and several operations to cover up and eventually remove much of the mesh tape from her body. 48-year-old Janet Roche only had her mesh removal operation this year, after seven years of chronic pain. “I don’t take chances, I’m not a lucky person and I never have been, so if they had mentioned for one second any of these risks, I would never have gone ahead with it. I have four kids, I wouldn’t have taken that risk,” she said. Roche said she is still experiencing pain and has been told she will probably have chronic pain for the rest of her life. Solicitor Melanie Power set up a support group on Facebook this year for women who have experienced issues following these procedures. There are now more than 100 members. There are some people in it who are getting quite active in the group, which is great. They have come to the realisation that this is a worldwide scandal. But a lot of people are overwhelmed by that. It’s hard for them to come to terms with the fact that they have this device in them and they don’t know how it will affect them in later years. For some, it’s just too much for them to deal with mentally and they don’t want to engage now, but they will when they’re ready. Sinn Féin TD Louise O’Reilly, who raised the issue in the Dáil with the Health Minister recently, has arranged for Power and some of the women impacted by these surgeries to make a presentation to TDs at Leinster House in January. “We’re probably two or three years away from an investigation into this, realistically,” Power said. “It’s going to be very easy for the government to say it’s only a minority of patients affected by it and that there’s no big issue – I’m preparing myself for that. The HSE has said it is the “responsibility of the consultant to explain to patients the risk involved with this procedure, as with any procedure”. It declined earlier this month to comment on recommendations made by the UK’s health watchdog to stop using mesh in surgeries to treat pelvic prolapse. A spokesperson, however, said the Minister for Health “has asked the government Chief Medical Officer, Dr Tony Holohan, to advise on the use of transvaginal mesh implants and that this will take a number of months to complete”. Email “More than ten women to sue the HSE in 2018 over vaginal mesh implants”. Feedback on “More than ten women to sue the HSE in 2018 over vaginal mesh implants”.